Both animal and plant innate immune systems rely on detection of conserved molecular patterns for stimulating anti-microbial responses. In plants, perception of patterns is mainly mediated by the membrane-localized pattern recognition receptors (PRRs). Several kinases of Arabidopsis receptor-like cytoplasmic kinase (RLCK) subfamily VII, which contains 46 members, have been shown to play important roles in pattern-triggered immunity, but it is poorly understood whether different RLCK VII members act specifically or redundantly in immune signaling. The group led by ZHOU Jian-Min at Institute of Genetics and Development Biology of Chinese Academy of Sciences uncovered a large number of RLCK VII members contributing to modulate plant immune signaling. Given the size of RLCK VII family, it has been difficult to empirically analyze their redundancy and specificity in different PRR signaling. They constructed 9 higher order mutants according to the phylogenetic tree and systematically characterized their immune phenotypes. 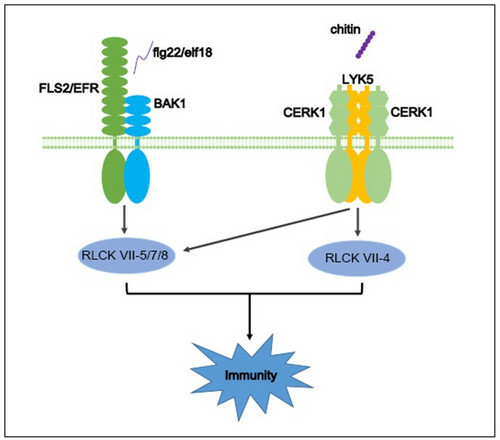 These analyses demonstrated that RLCK VII-5, 7 and 8 are involved in signaling downstream of multiple PRRs, while RLCK VII-4 specifically function in chitin-induced immunity. Further study showed that RLCK VII-4 members specifically link the chitin receptors to MAPK activation. This study revealed that both redundancy and specificity of RLCK VII subgroups in the context of different PRRs. This work entitled “Roles of receptor-like cytoplasmic kinase VII members in pattern-triggered immune signaling” has been published online on June 15, 2018 in Plant Physiology (https://doi.org/10.1104/pp.18.00486). This work was supported by the National Natural Science Foundation of China, the Strategic Priority Research Program of the Chinese Academy of Sciences, and the State Key Lab of Plant Genomics.